A grain gin, infused with 10 flavour components that include traditional botanicals such as juniper, coriander and citrus peel. The use of the less mainstream cucumber and rose petals results in a singular style. It's made a name for itself in a gin and tonic, served with a slice of cucumber. Hendrick's is an infusion of rose petal and cucumber gin made as a delightful antidote to the ordinary. 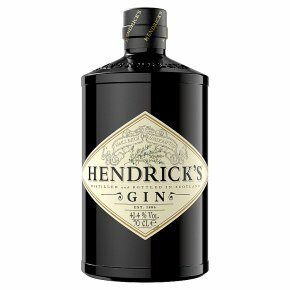 No other gin taste like Hendrick's because no other gin is made like Hendrick's. We infuse our gin with the remarkable Bulgarian Rosa Damascena and specially selected cucumbers from the finest producers. As befitting an artefact of imaginative endeavour, Hendrick's is presented in an alluring small Victorian apothecary-esque bottle topped with a cork stopper, to take, in your cabinet, a special pride of place. The potion is complete, ready to serve. A gin collection is surely incomplete without Hendrick's - a gin necessity to enjoy whenever the fancy takes you - to indulge and reward your curious self or to treat someone extraordinary.